Bullying is a pervasive problem that affects approximately 25-33% of students nationwide. It has been linked to depression, feelings of sadness and loneliness, isolation, anxiety, and many other clinical implications. It is also considered an ‘Adverse Childhood Experience’ by some. 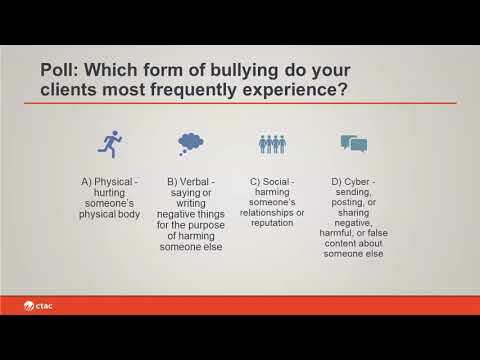 This webinar will review the various forms of bullying including, physical, verbal, and cyber, and explore clinical approaches to addressing bullying through case studies. Participants will better understand the impact of and develop skills to support young people who experience bullying. Kelly Conover, PhD, LCSW is a psychotherapist and licensed clinical social worker. Dr. Conover received her PhD in developmental psychology from the City College of New York Graduate Center and her M.S.W. from Fordham University. In addition, she earned a post-master’s certificate in clinical practice with adolescents from NYU. Dr. Conover has served as a clinician, clinical supervisor, and program coordinator. She has extensive experience working with young people and individuals who have experienced bullying.